Philadelphia Flyers center Sean Couturier is out four weeks after injuring his knee for the second time in five months. General manager Ron Hextall said Wednesday that Couturier was injured Aug. 10 during an offseason exhibition game. Hextall expects Couturier to be a limited participant in training camp when the Flyers get on the ice Sept. 14 and for the 25-year-old to be full-go halfway in and play in some preseason games. Couturier was playing in the summer Boot Camp Tournament in Quebec City when the latest injury happened. Hextall called it a “freak” accident, which similarly describes the knee-on-knee collision with Gudas in April. The Edmonton Oilers recently announced that defenseman Andrej Sekera was out indefinitely after having surgery on an Achilles tendon torn during offseason training. Hextall said Couturier would not require surgery, as was the case with his previous knee injury. 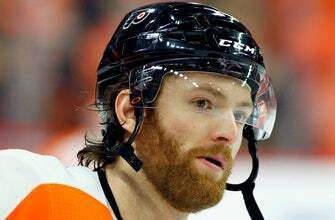 Couturier is coming off a breakout season in which he was promoted to Philadelphia’s No. 1 center and set career highs with 31 goals, 45 assists and 76 points. He was third on the team in scoring and finished second in voting for the Selke Trophy as the NHL’s best defensive forward. His injury isn’t expected to alter the Flyers’ plans to keep captain Claude Giroux at left wing after he flourished there last season playing on a line with Couturier. Hextall also isn’t concerned about Couturier being more susceptible to knee injuries moving forward.